I’ve always been intrigued with wireless keyboards for some reason. I can’t really put my finger on it, but the prospect of lying around the house, keyboard in tow, while watching stuff on a huge HDTV is probably part of the appeal. Oh wait, it’s not just part of the appeal, it has everything to do with it. Anyway, if you’re using a nettop or any other computer as a media center, the MSI Air keyboard is probably for you. It has a keyboard where you can enter words for search boxes and has the full complement of media keys and directional pad for controlling menus. It even has hot keys for search. What’s more, it can use motion detection so you can use it as a mouse. The RF based device needs a USB dongle to work and weighs 0.2kg. No word on how long the battery will last but it does use 2 replaceable AA batteries and goes to standby after inactivity. So I’m pretty much sold on this except for the AA batteries. Those things aren’t exactly known for their longevity. But then I think the MSI Air Keyboard is worth giving a try, though. Oh, yeah, one caveat: it’s available in Germany for now- no, wait, in March. So if you do find one next month, be willing to fork over €79 (US$108) for the MSI Air Keyboard. It works for Windows and Mac OS X, by the way, so I’m sure you’re thinking that it’s worth it. I’ve detailed the reasons why I’m not the least bit excited over the iPad in Gadzooki. To be honest, I’m not an Apple hater. I think the iPod – all its iterations – is the greatest thing ever. Macs are pretty spectacular devices. But the iPad left me a bit cold. And the disappointment over the iPad has left me looking for other touchscreen devices, and I see that MSI’s dual-screen netbooks are going on shelves pretty soon. MSI is taking advantage of the current tablet craze by pushing up the launch of the concept dual-screen netbook they showed off at CES a couple of weeks ago. LaptopMag found this out in its interview with MSI President Joseph Hsu and MSI VP for Sales and Marketing , North America Andy Tung. During the interview, Tung mentioned that the device will be a eReader and netbook combo, with the second screen acting as a haptic touchscreen keyboard when needed. They plan to release this mid-year with Google Chrome OS possibly bundled in. Despite the dual screens, MSI notes that the device will still boast 4-5 hours of battery life. The device itself looks pretty promising since it gives more screen space in the same netbook package. No price yet though I’m sure this will cost as much as a regular notebook with the new tech going into it. This won’t be an iPad-level hit to be sure, but it’s nice to see other manufacturers, MSI in particular creating something different from Apple’s products, unlike the Macbook air-like laptop they unveiled a few months ago. 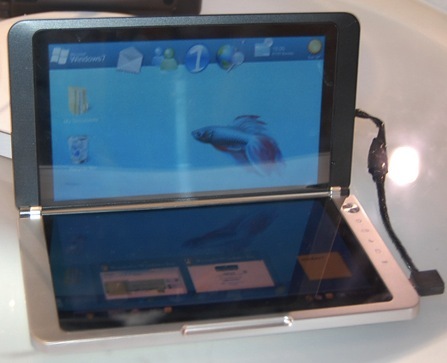 Sure, Asus conceptualized the idea first, but MSI beat practically every netbook manufacturer for doing this. 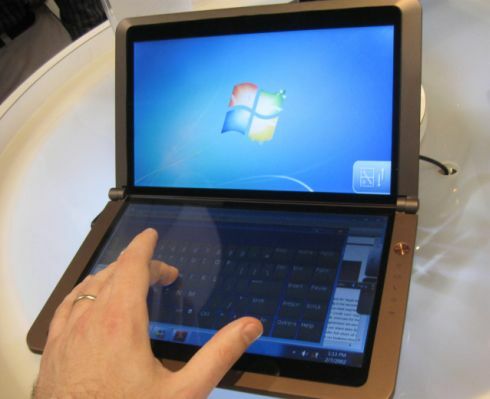 MSI is showing off a netbook prototype with twin 10 inch, 1024 x 600 pixel touchscreen displays and no physical keyboard. However, you can bring up an on-screen keyboard which, when pressed, actually vibrates the netbook. The haptic feedback is a nice touch, if you ask me. Aha, looks like my dream of owning a netbook running a dual-core CPU is slowly coming true. 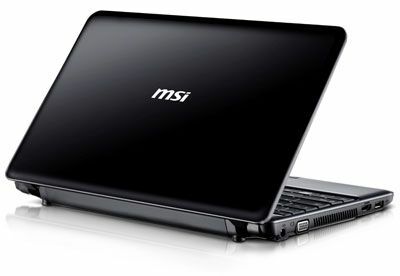 You see, the MSI Wind U230 was quietly released, rocking a 12.1-inch screen and a dual core AMD Neo X2 processor. Okay, I’m not too hot about the battery life, but everything else about this netbook looks fine.